phonetically, while others are written as found in Lakota books. Also, others may speak or spell a word differently; that is just fine. After all, we are all learning together! St. Joe's wah chee pee ake tah blay.= I am going to St. Joe's Pow Wow. Tan (dan-'t' is soft 'd') yan yahee ya (lo-ending for male; yea-ending for female) = Welcome, I am glad to see you. Mnee wah cheen = I am thristy. Phoenetic spelling: Oh makah txay ja = New Year! Doe ksh kay ya oun hey? = How are you? Oh ya hey he! = You can do it! Lay um pay tue keyn, Lakota (Nakota/Dakota) oh ya tay keyn, txa wa pay. 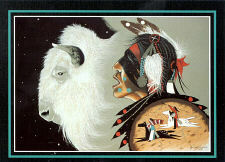 = This day belongs to the Lakota (Nakota/Dakota) people. Chuntay skoo ya = Sweetheart! Lila waste chi lake. (Lee la wash tay chee la kay) = I really like you very much!